On Saturday 29th June more than 250 demonstrators marched through Eastern Bristol and Bristol center in order to protest against the working and living conditions of the asylum seekers and refugees. Asylum seekers were forced to leave their countries and families because their lives were at risk by the imperialist development of the Western developed nation-states in order to exploit the natural and economic resources of these countries. This people arrived in the European Union (EU) seeking safety and a better future. But once they arrive here the big majority of them don´t receive support and they face many problems in their efforts to be part of our communities. They are not allowed to work (although are all blamed as lazy), they can´t receive any benefits (like housing benefit) and they have to report to a police station regularly. The refugees are marginalized from the EU states. They are refused rights that the rest of the people should enjoy. They are blamed by the governments and media with lies like that they get housing before local people or that they only come here because of the benefits system. Also they are blamed from the European governments to be criminals and terrorists while these governments participate and support the most violent wars in Asia and Africa. The increase of Nazism and Nationalism in the whole of Europe (Golden Dawn in Greece, English Defense League in United Kingdom, ELAM in Cyprus, The National Alliance or The New Force in Italy, etc. ), together with the huge austerity and the barbaric measures that send hundreds of thousands to unemployment in the Periphery of the EU and not only (especially in the UK this austerity has largely increased in the last two years) damage even more the asylum seekers´ situation in EU countries. The Governments in the EU have taken advantages of this crisis and they have used it as a pretext, in the name of confronting the economic crisis of capitalism, to apply racist policies in a shift towards conservatism and xenophobia. The EU is pioneer in this development: “The Dublin 2” Treaty, the creation of FRONTEX (European border policy already guardian the border between Greece and Turkey to prevent new immigrants entering the EU) and other are some examples. But such laws have led to a contradiction. On the one hand we inhabit an increasingly integrated and “borderless” world in which national barriers against the movement of money have been dismantled, on the other governments across the world have gone to extraordinary lengths to reinforce their frontiers with physical barriers, new technologies and personnel in order to restrict the movement of people. We cannot close our eyes to the thousands of dead immigrants, refugees, asylum seekers, women and children, being hunted by the guards of FRONTEX. The immigrants need legalization and the refugees need asylum, victims as they are of the imperialist wars, the dictatorships and the annihilating measures of austerity by the IMF. Denied to this people basic rights it is a lack of democracy. 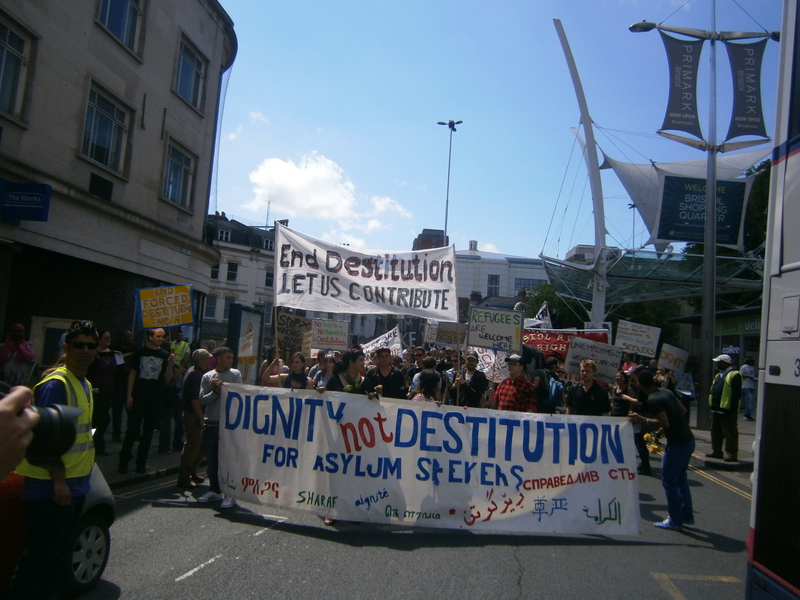 In Bristol, in 29th June we showed our solidarity and support to the Asylum Seekers, demanding from their recognition of their rights and their dignity as people and a real integration in our societies! We will not pay for their crisis! We will not pay for their wars! We support our brothers and sisters! Asylum seekers were forced to leave their countries and families because their lives were at risk by the imperialist development of the Western developed nation-states in order to exploit the natural and economic resources of these countries. This people arrived in the European Union (EU) seeking safety and a better future. But once they arrive here the big majority of them don´t receive support and they face many problems in their efforts to be part of our communities. They are not allowed to work (although are all blamed as lazy), they can´t receive any benefits (like housing benefit) and they have to report to a police station regularly. The refugees are marginalized from the EU societies. They are refused rights that the rest of the people should enjoy. They are blamed by the governments and media with lies like that they get housing before local people or that they only come here because of the benefits system. Also they are blamed from the European governments to be criminals and terrorists while these governments participate and support the most violent wars in Asia and Africa. In Bristol, in 29th June we show our solidarity and support to the Asylum Seekers, demanding from their recognition of their rights and their dignity as people and a real integration in our societies! George Osborne announced more and tougher austerity measures like that the unemployed people need to wait seven days before they can claim benefits, since he found a financial gap of 11.5 bn pounds more after 2015 and the general elections in the UK. George Osborne has unveiled a series of tough new welfare measures, including a seven-day wait before unemployed people can claim benefits, as he identified an extra £11.5bn in spending cuts for the first year after the 2015 general election. The chancellor said the changes would save £350m in the year 2015-16, helping ensure Britain “lives within its means” as the economy recovers from its worst downturn in a generation. The chancellor announced in his budget in March that he would have to cut current spending by £11.5bn, or 8.5%, for 2015-16 after admitting that he would not meet his target of ensuring debt falls as a proportion of GDP until 2017-18. The continuing austerity will lead to the loss of automatic pay rises for civil servants, the effective abolition, by introducing a temperature test, of winter fuel payments for British pensioners living abroad, and cuts across Whitehall that will see the communities and local government department’s current spending budget cut by 10%. But the chancellor tried to show the coalition is committed to promoting growth when he said that Danny Alexander, his Liberal Democrat deputy, would unveil £100bn in infrastructure projects on Thursday. Osborne was forced to put the brakes on further welfare cuts last year after the Lib Dems rejected further measures. But the chancellor has managed to squeeze a further £350m in cuts to benefits after toughening the rules for jobseekers. There will be a new seven-day wait before people can claim benefits. “Those first few days should be spent looking for work, not looking to sign on,” Osborne said. Under the changes, half of all jobseekers will have to attend their local jobcentre every week rather than once a fortnight. Benefit claimants who cannot speak English will lose their benefits if they refuse to attend a language course. Osborne placed the welfare changes at the heart of his statement – he left the announcements until the final section – as he sought to step up the pressure on Labour, which he called “the welfare party”. The chancellor sought to portray Ed Miliband’s party as both profligate, for opposing most of the welfare cuts introduced in recent years, and mean, as he appeared to raise questions about Labour’s commitment to the basic state pension. As he forecast in the budget, the chancellor announced that a cap would be introduced from April 2015 on the parts of welfare spending that do not rise and fall with the fluctuating economy. This will mean that housing benefit, tax credits, disability benefits and pensioner benefits will be included in the cap. But Osborne made clear that the state pension would be exempt, drawing a distinction with Labour, which recently announced that it would be included in its cap. The chancellor echoed the language of Gordon Brown as he mocked Ed Balls by saying: “I have had representations that we should include the basic state pension in the welfare cap. That would mean that a future government could offset a rise in working-age benefits by cutting the pensions of older people. Balls insisted that Labour remained committed to the so-called triple lock, according to which the state pension would rise in line with average UK earnings, the rise in CPI inflation or a standard rise of 2.5%, whichever of those three is the highest. The chancellor confirmed that the schools, health and overseas aid budget would be protected. He said £3bn would be spent by 2015-16 to ensure that the NHS and local authorities worked together to improve the provision of social care. Osborne, who predicted the changes would save £1bn, said: “Let’s stop the tragedy of people being dropped in A&E on a Friday night to spend the weekend in hospital because we can’t look after them properly in social care. The education budget increases from £52.8bn in 2014-15 to £53.2bn in 2015-16, allowing for 180 new free schools to be created in that year. The schools funding system in England would also be reformed to ensure it was distributed more equally, he said. The only way that the workers should deal with this situation is, while the rich become richer and the poor poorer in the British society, to go on strikes, by overcoming their fear of dismissal, to fight for their rights and to import direct democracy to their working places. The workers must take the future in their hands and react within their grass-roots labour unions! The Liverpool Trades Union Council stands in support of the ERT workers and the Greek people in their fight against the decision by the Greek Government to shut down the national broadcasting organisation (ERT). This decision, part of the government attack of austerity and privatisation under the supervision of the Troika is an attack to democracy, the public right to information and it is leading to unemployment more than 2700 ERT employees. Liverpool TUC sends its full support and solidarity to the Greek workers and trade Unions that fight against austerity and the attacks to public services. Next Regular Assembly of Real Democracy Bristol is going to take place on Tuesday the 2nd of July, 18.00, at YHA, 14 Narrow Quay, BS1 4QA, Bristol. We are inviting the people in order to discuss about the recent development and our future actions. It is not only 20 cents! What started in Sao Paulo as a protest against prices for public transport is turning into a widespread movement. Protests in 80 cities, more than 2.000.000 people in the streets and slogans going far beyond the protest against the 20 cents raise for bus fares decided by the municipality of Sao Paulo. Twenty years have passed since the last mass protests in Brazil, twenty years during which the country has established itself as one of the strong emerging economy, a member of the so-called BRICS. As the international profile of the country was growing rapidly, the vast majority of people did not benefit from this growth, leaving Brazil with huge inequalities and a massive corruption. An emerging economy for whom? As their country is spending billions for the upcoming World Cup and Olympic Games, Brazilians are wondering if the high taxes they’re paying would not be better spent to improve basic social needs like education, health, security and public transport. Addressing the country on television the 18th of June, President Dilma Roussef praised the peaceful and democratic protests, unveiling new reforms such as the use of 100% of oil royalties for education. Although the presidential speech was of a conciliatory tone, protesters noted that there was nothing peaceful in the repression of the manifestations by riots police, and in order to keep the pressure on the government called for a national protest on Saturday 22nd of June. 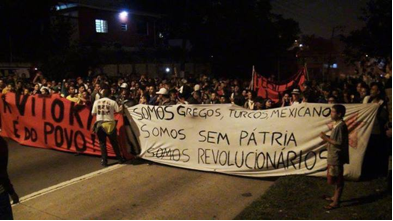 “We are Greek, Turkish, Mexicans. We have no motherland. We are revolutionaries”. 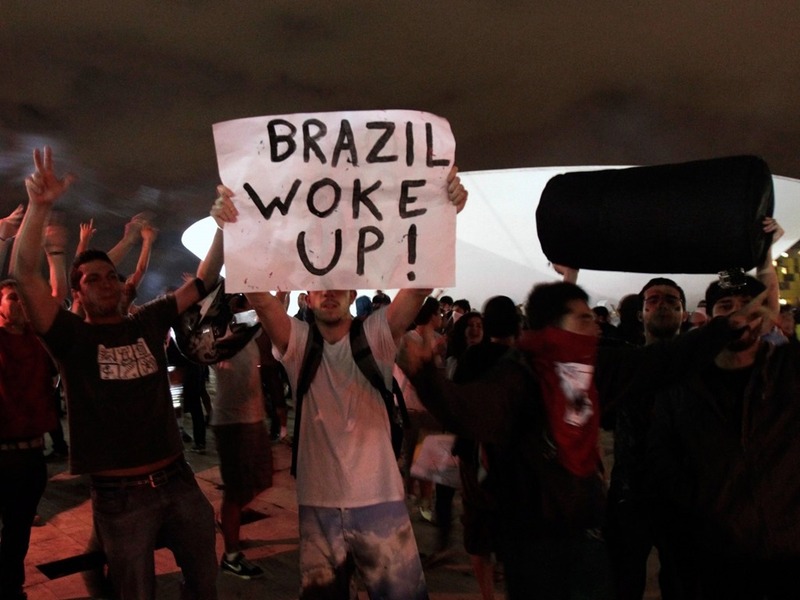 From a banner in one of the demos in Sao Paulo. Today, the Greek government ordered the employees of the Greek Public Broadcaster (ERT) to evacuate the premises of the broadcaster. They also announced that the closure of ERT is definite and that a new broadcaster will be launched with fewer employees in an indefinite period. The union of ERT workers issued the following announcement as a response. The government will most probably send the riot police to evacuate the building in Aghia Paraskevi-Athens in the coming hours or days. We ask for your solidarity. It is violence to make us give up! It is violence to bring us to our knees! It is violence to intimidate us! We are continuing our struggle undeterred, we are defending democracy! Fundamental labour rights and democracy itself are being trampled on. The employees do not allow anyone to represent or negotiate them! The want to set an example for all public sector employees, that they managed to find the formula for LAYOFFS in the public sector, to add more to the unemployment percentage that is rising at a head-spinning rate! they want to raze democracy and every sense of labour law and right! We are answering: The now two-party coalition government, will not terrorize us with its authoritarianism! We are working for public ERT, we are defending democracy! We are not giving up the fight, unless ERT opens again as if it had never been shut down for even a day, without any layoffs or violation of labour rights. The law department will exhaust all legal means! The same people who nominated the corrupt managements, the same who gradually transformed Public Radiotelevision into a state mechanism of government propaganda, are presenting themselves as the uncorrupted who will impose transparency, by turning ERT off. IS THE SILENCE OF OUR CIVILISATION! The struggle for the reinstitution of Democracy is a question of the people’s survival! THIS IS ERT! THIS IS ERT! BROADCASTER OF DEMOCRACY! * Alteration of the phrase “This is the Polytechnic School! This is the Polytechnic School” (word-to-word: Polytechnic Here!) that was heard from the radio station of the insurgent students of the Polytechnic School against the military junta in November 1973. For the last developments in Greece. We will overthrow this government and ERT will be open! The past few days, there have been rapid developments in Greece, mainly shaded by the sudden, and final as stated by the “Top Board (I don’t know how to translate that in English)” last night, shut down of ERT (Greek Public Broadcaster). As a consequence, around 2,500 people were fired out of the blue in an illegal way. The anti-democratic decision of the Greek government to shut down the state TV and radio broadcaster (Hellenic Broadcasting Corporation-ERT) is of great concern to democratic rights and press freedom. First of all Greece is now the only European nation-state without a public broadcaster. Second, the closure of the national broadcaster is of great significance since it shows that freedom of speech has been already banned in Greece. Third, more than 2,500 employees have been dismissed. Fourth, the program content of the state broadcaster was extremely significant and differentiated from the other private broadcasters, being the means of culture’s promotion and the means of Greek immigrants to stay connected with their country. Fifth, the media in Greece now will be dominated and controlled only by private interests. The property of ERT has been paid by the Greek people and should not be allowed to be offered to the private interests that already use ERT’s TV and radio frequencies. ERT is the first public asset to be restructured and will be followed by a huge privatisation program regarding hospitals, schools, harbours and airports. Until now the 3 TV channels and the 19 (mainly regional) radio stations were spreading information to the whole Greece and the world. This is another success story for the government of Samaras which destroys everything in cooperation with the EU, the ECB and the IMF. The employees (journalists, technicians and others) have occupied the broadcasting building of the public television and radio. They are in continuous assembly and strike until they win! They also invite all workers, unemployed and youth into the building in order to defend the public television and radio company. The Greek National Union of Journalists has voted for continuous strike and thousands of people support the occupation every day. People resist! The way the government chose to take that action is far from what constitutional law states. Most importantly its sudden and unacceptable way of shutting down mainly reflects the lack of real democracy and the general crisis in the Greek state. Yesterday, one of the three parties (“Dimokratiki Aristera” – Democratic Left) of the Greek coalition government, after expressing its opposition to the shutdown of ERT, made almost clear their intentions of “pulling out” from the government, leading to the issue of the political legitimation of the government. The crisis in Greece is deeper than ever! We are not only experiencing economic crisis, but political and institutional crisis as well…we are not living in times of democracy…we are living in times of secret coalitions, governmental arbitrariness and continuous disrespect to the human value! We need to demand and fight for a better future! Let our voices unite and be heard! Workers in ERT and people in Greece are not alone. We express our solidarity to the workers in ERT, to the workers, youth and unemployed people in Greece! Shut down this government immediately!!! Giorgos Antoniou, Samaras’s koumbaros , who was appointed by Samaras with a monthly salary of €3,500. Menelaos Sevastiadis, koumbaros of Samaras’s communications director Giorgos Mouroutis, also appointed with a monthly salary of €3,500. Matina Retsa, who comes from the same place as Minister of Information and government spokesman Simos Kedikoglou, and who has run for office sometimes on a PASOK, sometimes on a New Democracy ticket. She received a monthly salary of €3,000, has never showed up at ERT, but does answer calls on Mr. Kedikoglou’s mobile phone. 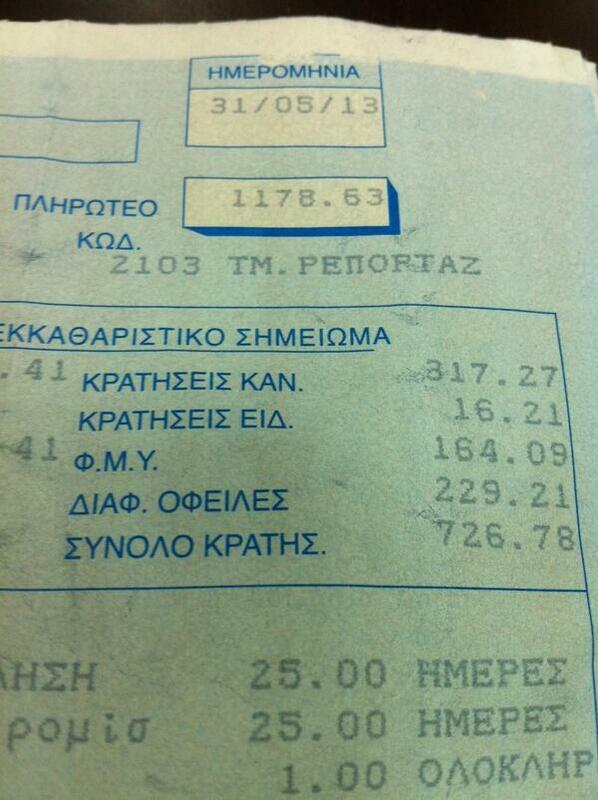 Stavros Oikonomopoulos, who comes from Messinia (Samaras’s constituency) and also earns a monthly salary of €3,500. Manousios Kambanelis, from Euboea (Kedikoglou’s constituency), a sports trainer by profession and a party official under Kedikoglou, who was appointed to the position of office manager of ERT’s executive director with a monthly salary of €3,500. The allocation of a €1 million budget to the show “Mesogeion 136”, which was created to give a job to Mrs. Anthi Salagkoudi (former New Democracy candidate and daughter of former New Democracy Finance Minister Giorgos Salagkoudis), as well as other relatives of New Democracy officials who got jobs with ERT. ERT’s legal department refused to sign the contract with this show’s production company, a contract that was drafted by the office of news director Aimilios Liatsos [Editor’s note: Liatsos was also appointed to the position of news director by the Samaras government]. The case of the show “Epta” (“Seven”), which is already under investigation for criminal impersonation: a retired journalist, friend of A. Liatsos, was recruited as the show’s editor-in-chief, but because, being a pensioner, he could not receive a salary, the editor-in-chief, on paper, was his son, who was then doing his military service. The case of the owner of a well-known production company with links to New Democracy, who managed to place her son as the coordinator of ERT’s programming department. The said company produces two shows for ERT. Watching the proposal being examined by a committee chaired by Samaras’s koumbaros Giorgos Antoniou. Samaras: Those who defend ERT used to say it is “manipulated”. Samaras: Those who defend ERT used to say it is “discredited”. Kogiannis: This is, no doubt, the reason why ERT will now not be able to participate in the tendering process for digital network providers – meaning that the sole viable bid will be submitted by DIGEA, a consortium of Greece’s six largest private media groups. ERT produced losses of €9 million in 2009, profits of €34 million in 2010 and profits of €57 million in 2011. In 2012, Samaras chose to reallocate €75 million from ERT’s profits to LAGIE, the Greek electricity market operator. Despite this, ERT still had a surplus of €15 million, meaning that its total profits were €90 million. 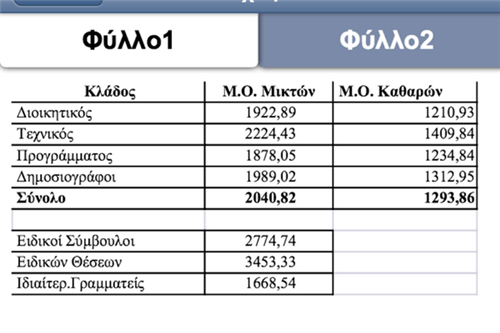 Kogiannis also put online the table pictured to the right, which gives the average salaries of permanent ERT staff (top to bottom: administrative staff, technicians, programmes staff, journalists) and those of “special” staff (i.e. political appointees – top to bottom: special advisors, special positions and personnal assistants.) The left column is gross salary while the right column is take-home pay before income tax. The Greek word koumbaros literally means “best man” but can apply both ways (i.e. the person who was best man at your wedding but also the person whose best man you were at their wedding.) It can also apply to any non-relative with whom you have a near-family relationship, for instance the parent of a child you baptized, or the godfather of your nephew/niece, etc.